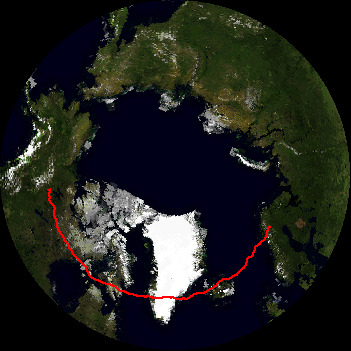 Over the last two days, Super-TIGER has gotten out of the Trans-Antarctic Mountains and moved roughly back to the same path we took on our second trip around. Starting the third revolution in earnest also means that CSBF's tracking image now shows our second revolution in blue, along with our first revolution in green and our current track in red. Thursday night, Thomas took over the shift in McMurdo, meaning JohnE and I had the night off. During the day Thursday, I wandered out to Hut Point (no penguins, although Asad and Michele from EBEX saw one just before I went down there, and Thomas saw a bunch closer to dinner) and then hiked the Observation Hill loop (no close Skua sightings this time). After dinner, I started walking over to Scott Base with JohnE and Elio from BLAST. It's about a 40 minute walk, so we got to the Scott Base store about a half hour before it closed. I got a few souvenirs and gifts (and also some shampoo, since I accidentally left my shampoo bottle in the shower last week and it walked off before I remembered that, and then the McMurdo store was out of shampoo, and isn't expecting any for a couple of weeks). Sean, who had taken a shuttle over, actually beat us there and was in the store when we arrived. We then went to the Scott Base bar, which has great views of the surrounding area and (now melting) pressure ridges. Eventually, we walked back to McMurdo and stopped by to bring Thomas a cup of coffee from the dining hall. While JohnE was carrying the coffee on the way to Crary, a skua flew about a meter over his shoulder, having recognized that he was carrying something and wanting to see if he'd drop it. After lunch on Friday (5-cheese grilled cheese and cheddar-apple-bacon sandwiches. It's a harsh continent), JohnE, Sean, and I headed out to Hut Point. Somehow, Sean hadn't been down to Hut Point before, so we gave him the 30-second tour of all the sights. There were no penguins hanging around today, and the wind was pretty strong, so we went back into town. Earlier in the week (and I'm still not entirely sure why) I got an email inviting me to a reception for some of the Assistant Directors of the National Science Foundation, who were touring the NSF facilities in Antarctica these past couple of days. I also got to meet the director of the NSF's Office of Polar Programs. (As a grad student, I have to report that the free food at this reception was top-notch, especially the Chicken Satay and the Fried Cheesecake, which I was skeptical of but tasted really good).